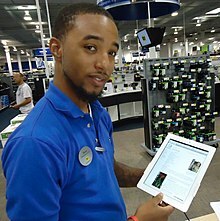 Best Buy was named "Company of the Year" by Forbes magazine in 2004, "Specialty Retailer of the Decade" by Discount Store News in 2001, ranked in the Top 10 of "America's Most Generous Corporations" by Forbes in 2005 (based on 2004 giving), made Fortune magazine's list of "Most Admired Companies" in 2006. and "The Most Sustainable Company in the United States" by Barron's in 2019. Hubert Joly currently serves as Best Buy's chairman and CEO, to be succeeded by Corie Barry in June 2019. According to Yahoo! Finance, Best Buy is the largest specialty retailer in the United States consumer electronics retail industry. The company ranked No. 72 in the 2018 Fortune 500 list of the largest United States corporations by total revenue. Former Best Buy Store located in Shanghai, China, now closed and merged with Five Star. 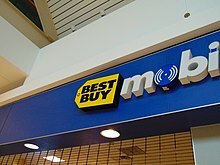 This Best Buy logo has appeared at Mall of America since 2008. Best Buy opens its 800th store in Chicago, Illinois. A Best Buy store in Germantown, Maryland that opened in 2002. On April 15, 2019, Best Buy announced its current CFO, Corie Barry, will be its next CEO. She will replace Hubert Joly, who served as CEO since August of 2012. ^ "Best Buy Co., Inc. Form 10-K (FY February 3, 2018)". U.S. Securities and Exchange Commission. Retrieved June 6, 2018. ^ Norton, Leslie P. "The 100 Most Sustainable U.S. Companies". www.barrons.com. Retrieved February 22, 2019. ^ a b Thomas Lee (August 19, 2013). "A year on the job with Best Buy CEO Hubert Joly". Star Tribune. Retrieved January 14, 2013. ^ a b "Best Buy Will Get Its First-Ever Female CEO in June". Fortune. Retrieved April 22, 2019. ^ Mayfield, Geoff (November 29, 2003). "Same-week rise continues. (Over the Counter[TM])". Billboard.